I'm working on an online tool for creating Infinity characters. It is still in BETA and probably ridden with bugs and other problems. Please write any feedback in this thread and I will look at it. Any help is appreciated. Uploaded an update today with performance optimizations and bug fixes, so if you experienced problems with the tool during the weekend, please test it again and let me know if the experience is better for you now. 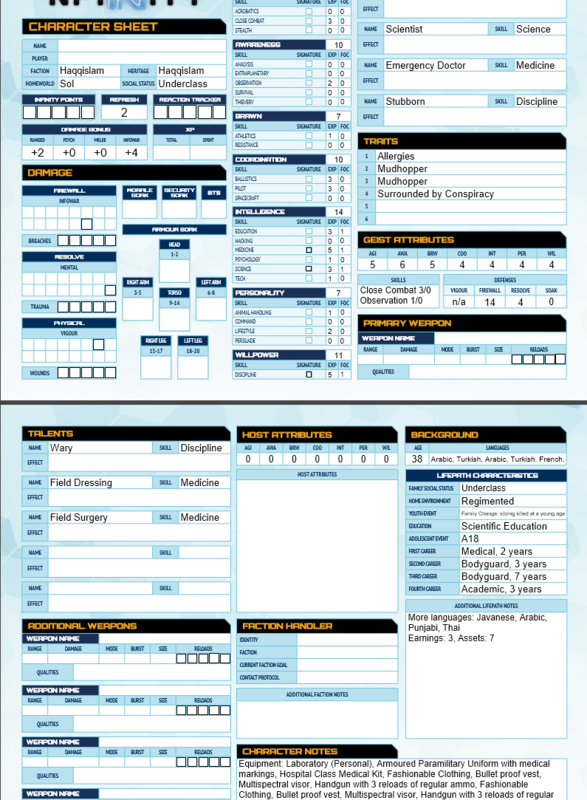 Are you planning a character creator for Conan? It will be a bit simpler as the character creation process for Conan is not as advanced as in Infinity and Mutant Chronicles. I'm excited about thst. When you post the link, I'll be sure to stickify it, like I have with your other creators. Thanks for the awesome work. I've done a lot of mucking around with the creator, and most of the issues I've emailed to you. I can post screenshots if that'll help. Okay, it's bugging out on me lots this afternoon. Rolling Ariadna randomly seems to ALWAYS get stuck on home environment. Can't click on youth event. The loading square comes up and never stops. Also, once I roll Ariadna once, the next new characters seem locked into Adriadna. I used a LP to pick Haqq on the next go, and got stuck on Youth Event again. :( The loading square came up, but never proceeded. Thanks for the feedback, I will look into this. Still rolling only Ariadna this morning and still stuck before Youth Event. :( It's stuck for everything, even the 12 LP choose the path. 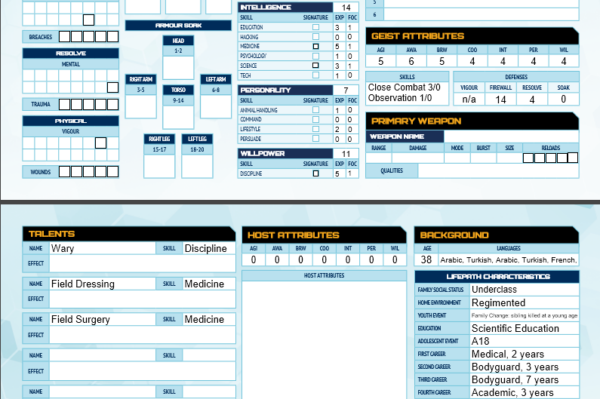 Only thing I've not tested is dogface, since I've never passed that roll. On the Birth Host step, once you take away a point, you have the choice to add it to anything, even if it's at 8, only it doesn't add the point, but it stays taken away with no way to fix. It's definitely not taking proper LP for the career phase as well. On the final tweaks step where you can increase from 0-1, it's letting you increase anything (to the cap). I can go from 1-2 or 2-3. It let me take 2 ranks in Maya wired. 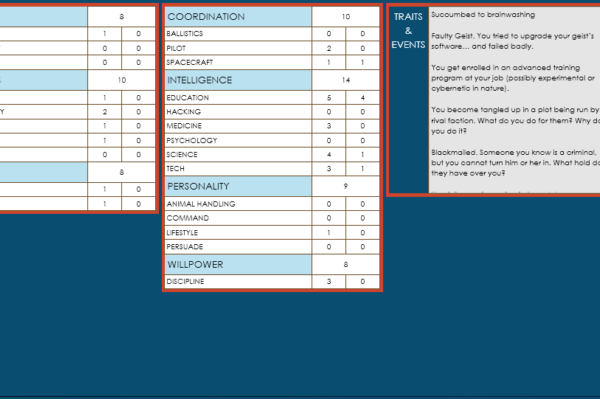 The B18 adolescent event doesn't populate for the lifepath characteristics on the character sheet (just says B18). 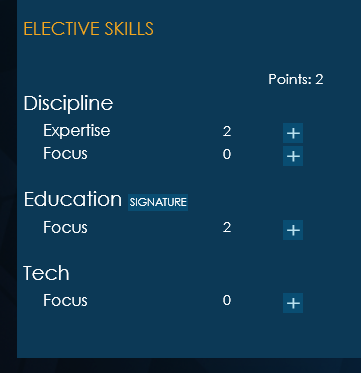 Doesn't show additional ranks of a skill on the PDF. In the geist step, anytime I put 3 points in a single skill, when I allocate the 4th, + buttons stay visible for Animal Handling and Close Combat expertise, but are not clickable. It appears as though the + no longer appears when a skill is maxed in Mandatory, but that the expertise disappears in the optional section if maxed. This is very confusing. Analysis and Athletic trees seem good. Though I got stuck on final tweaks again (12 LP). 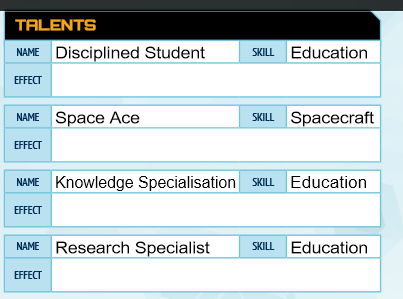 The custom career is ALWAYS getting stuck on final tweaks. 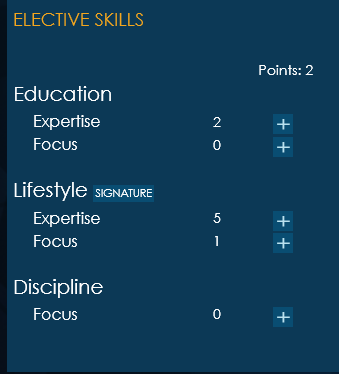 If you take a signature skill right up to 5 expertise, you cannot go from 4 to 5 focus in the elective skills (for education at least).